The phrase "landscape design" or "interior of a country house" evoke a person's Association with a beautiful coffee lifestyle. Unfortunately, professional execution of these activities is quite expensive. But the owners of ordinary cottages if desired, you can Refine your plot and house as well as designers, using elementary methods. If the task is to elevate the country involves the creation of attractive plot, start with the site plan. Measure tape measure the area on the sheet of paper apply the plan with a pencil, mark the home, bath, other buildings, orchard and garden – all important parts in the country. Write a list of solutions that you would like to do in the area: Alpine slide, a rock garden, flower garden, lake, paved area, greenhouse, gazebo, bench, walkway gravel and so on. Divide the plan area into zones, and mark with colored pencils all these details where you want them to see. Unfortunately, the standard plots have an area of only six acres, and a flight of fancy can take you away. Look to see if the site cluttered with unnecessary details, remove the unnecessary to have everything in harmony. Outbuildings at the cottage, it is desirable to hide behind hedgerows or coniferous trees. 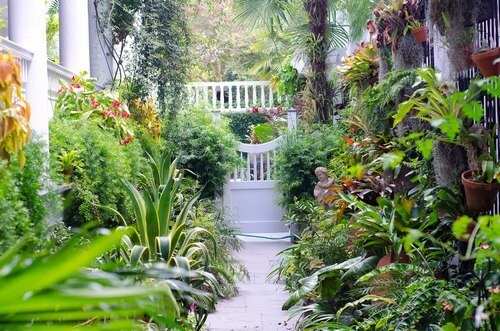 The garden is also not always scenic, so make a decorative low fence or a fence. In front of the house, it is recommended to leave a small area with lawn and path, which grasses. Among the flowers you can plant shrubs of different sizes. When choosing a place to plant, consider the position of the sun. Having all the details, consider how it will look from my living room window in the house or from the terrace. Buy the necessary plants and trees. Note that conifers are growing longer, so if your goal is to close pine toilet neighbor, will have to wait or replace the tree with another item. You can buy adult plants, for example, if you want the New year to spend in the country, buy a Christmas tree growth meter seventy. All other accent trees are also better to purchase from large, well-formed crown, as they determine the composition. Decorate the terrace with a beautiful canopy that you can make yourself or buy. There are quite cheap canopies and gazebos from a new material – polycarbonate, through which passes sunlight. You can select and blackout material. Other elements of landscape design you can do yourself, to show imagination. Break the rock garden or make a waterfall, if you have a multi-level territory. To elevate the country from the inside, that is, to equip the interior of the house, buy or make a fireplace – the symbol of comfort, warmth and a home. It can be used for heating and as a decorative element. To decorate rooms in a country house will help a small fountain, vases and bowls, sculpture and other decorative pieces. If you don't want to spend money on these things, try to Refine the interior with its hand – embroidered, for his paintings, self-made furniture. To cultivate a garden, raise garden beds, relegating them to wooden boxes.